We had chilly but sunny weather for this year’s Remembrance Day parade. 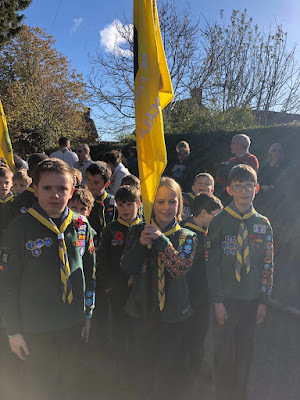 The Cubs met at St Mary’s Church at 9.30 am, together with Beavers, Scouts, Explorers and members of other organisations in Kidlington. We then took part in the service, including seeing our flag carried in by Bethany. This was followed by a reading out of the names at the war memorial, laying of the wreaths and a two minute silence. We then formed up and marched into the village centre. Bethany carried the flag, with Philip and Tom as flag escorts. Joseph acted as one of the escorts for the Group flag. We had our best ever turnout, with all leaders present and just one of our 31 Cubs missing. Everyone was smartly presented and behaviour in the church and on parade was excellent - well done everyone!